In Make it Count, Harry Roberts describes blacking out on stage at the end of a busy and sleepless week. Ironically, he was at the start of a talk in which he was to discuss being selective over side projects, choosing only those that you can actually “cash in” on and use to advance your career. Obviously working until you collapse is not healthy. At that point, choosing which projects to accept is less important than just getting some damned sleep and putting your health back in order. 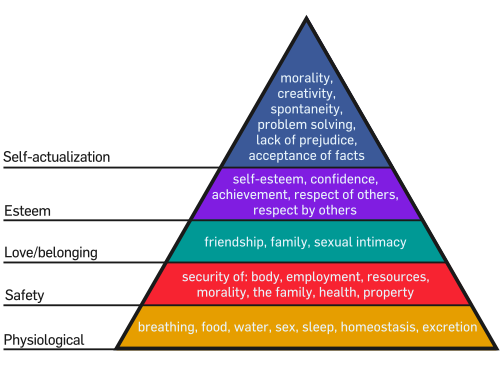 In the 1950s, psychologist Abraham Maslow identified a “hierarchy of needs”, and sleep is at the base of the hierarchy meaning that, along with eating and drinking, you should take care of that before worrying about self-actualisation or esteem in the eyes of your peers. Here’s the little secret they don’t tell you in the hiring interview at Silicon Valley start-ups: you’re allowed to do things that aren’t career-centric. This includes, but is not limited to, sleeping, drinking enough water, eating non-pizza foodstuffs, having fun, seeing friends, taking breaks, and indulging in hobbies. It sometimes seems that programmers are locked in an arms race to see who can burn out first^W^W^Wdo more work than the others. That’s a short-term, economist-style view of work. I explained in APPropriate Behaviour that economists take things they don’t want to consider, or can’t work out a dollar value for, and call them “externalities” that lie outside the system. Your health should not be an externality. Roberts attempted to internalise the “accounting” for all of his side projects by relating them in value to his career position. If you’re unhealthy, your career will suffer. So will the rest of your life. Don’t externalise your health. Worry not whether what you’re doing is good for your position in the developer community, but whether it’s good for you as a healthy individual. If you’ve got the basic things like food, shelter, sleep and safety, then validation in the eyes of yourself and your peers can follow. Could effortless lecturers make everything seem too easy? From the British Psychological Society blog: Engaging lecturers can breed overconfidence. The students who’d seen the smooth lecturer thought they would do much better than did the students who saw the awkward lecturer, consistent with the idea that a fluent speaker breeds confidence. In fact, both groups of students fared equally well in the test. In the case of the students in the fluent lecturer condition, this wasn’t as good as they’d predicted. Their greater confidence was misplaced. I’m speaking at a couple of conferences later this year (iOSDev UK in Aberystwyth in September and NSScotland in Edinburgh in October), and will endeavour to be exactly as exciting as the material deserves: a capability to which my track record can attest.